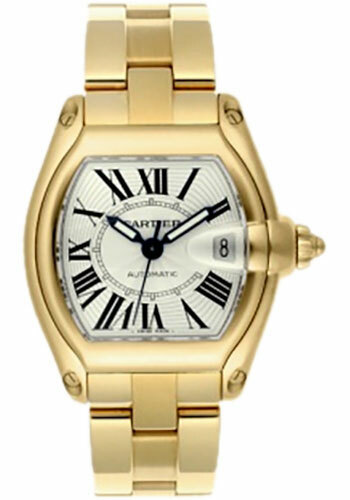 Large size, 18K yellow gold case, silver sunray dial, automatic winding mechanical movement. Includes interchangeable 18K yellow gold bracelet, extra strap, and an 18K yellow gold deployant buckle. Water resistant to 100 meters (330 feet). Large size, stainless steel case, silver sunray dial, automatic winding mechanical movement. Includes interchangeable stainless steel bracelet, extra strap, and a stainless steel deployant buckle. Water resistant to 100 meters (330 feet). Large size, stainless steel and 18K yellow gold case, silver sunray dial, automatic winding mechanical movement. Includes interchangeable leather strap and a stainless steel deployant buckle. Water resistant to 100 meters (330 feet). Large size, stainless steel case, black dial, automatic winding mechanical movement. Includes interchangeable stainless steel bracelet, extra strap, and a stainless steel deployant buckle. Water resistant to 100 meters (330 feet). Large size (45.9mm x 45.6mm) stainless steel case, satin finished stainless steel bezel, silvered opaline dial with Roman numerals, automatic winding Cartier caliber 049 movement with calendar aperture at 3 o'clock, interchangeable satin finished stainless steel bracelet. Water resistant to 100 meters. Large size (45.9mm x 45.6mm) stainless steel case, ADLC coated bezel, silvered opaline dial with Roman numerals, automatic winding Cartier caliber 049 movement with calendar aperture at 3 o'clock, interchangeable black rubber strap with double adjustable deployant buckle. Water resistant to 100 meters.